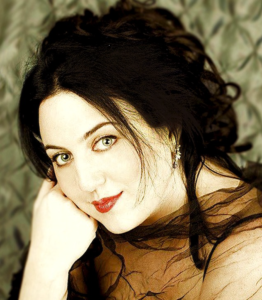 Anna Skibinsky debuted at the Teatro alla Scala in Milan in November 2004 as Olympia in LES CONTES D’HOFFMANN under the baton of Maestro Gary Bertini and these performances brought her to the forefront of the new generation of opera artists. Ms. Skibinsky performed title roles at some of the most prestigious Opera houses and concert halls in the world including New York City Opera as Adina L’ELISIR D’AMORE, directed by Jonathan Miller, and Nanetta FALSTAFF. Her European appearances include Koenigin der Nacht DIE ZAUBERFLOETE at Opera d’Avignon, France and Deutsche Oper Berlin. Ms. Skibinsky’s roles in Italy include Sophie WERTHER and Gilda RIGOLETTO at the Teatro Giuseppe Verde in Trieste as well as Donna Anna DON GIOVANNI at the Teatro Verdi in Salerno – all under the baton of Maestro Daniel Oren. Additional roles include: Marzelline FIDELIO at Teatro di San Carlo (Naples), Olympia LES CONTES D’HOFFMANN at the Teatro Regio in Torino, Violetta LA TRAVIATA at the Maggio Musicale Fiorentino. Miss Skibinsky has appeared in gala concerts at the Quirinale in Rome and the Santa Cecilia Academy Orchestra and Chorus, conducted by Maestro Daniel Oren. Other concert appearances include the Hungarian State Opera, The Israeli Philharmonic, Israel Symphony Orchestra Rishon LeZion, Alice Tully Hall in New York, English Chamber Orchestra at the Barbican Hall in London UK and most recently in solo recital at the Bunkan Kaikan Hall in Tokyo, Japan. Born in Russia, Anna Skibinsky first studied and performed as a concert pianist before her vocal training commenced. After immigrating to Israel, she made the transition from pianist to operatic soprano. She has been heard frequently in Israel in concerts and productions with the New Israeli Opera including Gilda RIGOLETTO in a renowned production by David Pountney under the baton of Dan Ettinger. Other roles for the company have also included Koenigin der Nacht DIE ZAUBERFLOETE, Oscar UN BALLO IN MASCHERA, Violetta LA TRAVIATA and Valencienne in DIE LUSTIGE WITWE.